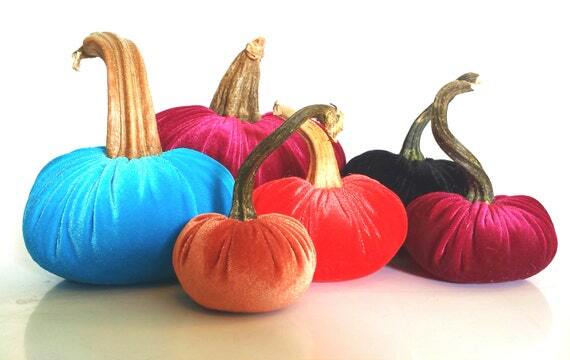 Sweet velvet pumpkins with real pumpkin stems have been added to my etsy shop's NEW home decor section! Sizes and color details below! The stems are real and each one is unique. I connect the stem to the pumpkin to make it appear as though the stem is truly growing from the velvet and use Extra Strength Gorilla Super Glue to attach the stem - so no need to worry about the stem popping off! These sweet little guys are stuffed with white rice and poly fill to give them that plump pumpkin shape. These pumpkins are a perfect addition to your home's autumn decor - and would make a lovely Thanksgiving table centerpiece.